For 3.5 billion years Nature has run an uninterrupted experiment involving the continuous evolution of higher developed life forms. This is Nature's first and final experiment. Humans are its most recent manifestation. And at the rate we're going, perhaps its last. Unlike any other creature on this planet we are not only subjects of that experiment but also independent objects, able to change the outcome of the experiment because of our ability to consciously choose. Yet despite our relative consciousness about this role we don't exercise much conscientiousness about it. Is it possible we actually don't care about the outcome? Today, our world has reached an apotheosis in which we are actually capable of ultimately destroying this unique experiment. But even if we're not that stupid to act so drastically, we might nevertheless be intervening in this experimental process by virtue of our (as yet) insufficient knowledge about what we're doing. For example, we are misusing the natural variability of the global climate to establish new profitable branches of industry, to instigate fear among the poorly educated peoples, and to funnel their financial resources into a few select pockets. And it is this very same poor education that has ill equipped us to comprehend a vital point; that the experiment of Nature is running on a much broader stage than that of our blue planet. 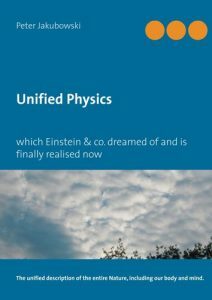 Unified Physics has demonstrably shown that we cannot understand the enormous risks of the experiment of Nature as long as we constrict our perspective to our terrestrial horizon. Fortunately for our children and the next generations, the climate poker is over now. But there are two other hazards connected with Nature's experiment. And according to those two challenges (enhanced frequency of the strongest earthquakes, and enhanced frequency of cosmic impacts) we are still completely inept at reacting appropriately.